Front row from left are Steve Hermann (father), Sydney Hermann, Tiffany Hermann (mother), Cooper Hermann (brother). Back row are Jason Leavitt (Po-Hi Athletic Director), Larry Degan (Junior High Golf Coach), Jim McGrew of Dalton State, C.J. Thurber (Ponca City Head Girls Golf Coach), and Rod Alexander (Wentz Golf Pro). Picture taken by David Miller, The Ponca City News. 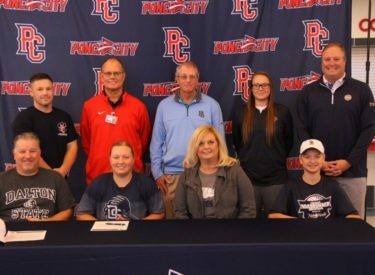 Ponca City High School athlete Sydney Hermann has signed a Letter of Intent to play golf at Dalton State College in Dalton, Georgia, committing to a four-year scholarship. Dalton State is currently ranked No. 4 in NAIA. They were National Runners-up in 2015 and have finished in the top four each year since. They have also received 13 national scholar awards since 2013, making them one of the most successful teams in the National Association of Intercollegiate Athletics.